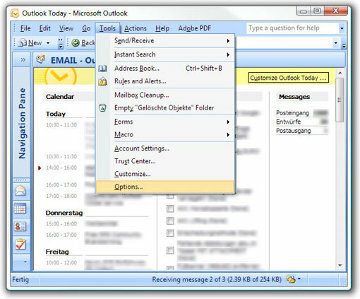 SUPER-HINT: Outlook 2007: Forward incoming mail as text messages. SUPER-HINT: Forward incoming mail as text messages. It is friday afternoon and Adrian Walliser is waiting for an important e-mail. If it does not arrive until 6 o'clock he has to check with the acording business partner. The sun is shining outside and all his work mates have knocked off early to go for a swim at the river. Adrian thinks about following his collegues and returning to the office at six. But that won't be worthwile. "Crap, now I have to stay and wait for an e-mail!". No, there is no need to stay in the office and wait! 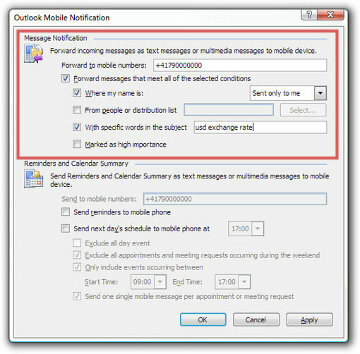 Because Adrian is using Outlook Mobile Service he can set a Notification. As soon as the required e-mail arrives in his inbox it will be forwarded as text message to his mobile phone. So Adrian sets a notification for the expected e-mail and follows his colleagues to the river. 3. 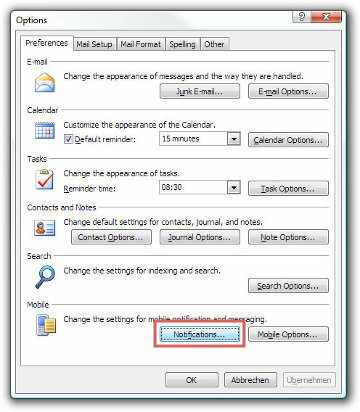 Specify the conditions on which an e-mail should be forwarded and enter the phone number you would like the e-mail to be forwarded to. 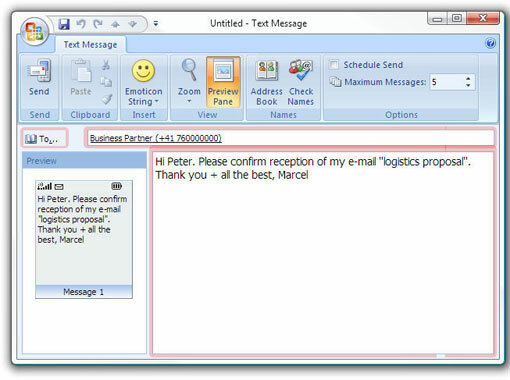 Hint: Alternatively you can also use Rules and Alerts to forward e-mails to your mobile phone. This way you can specify some more specific rules. Adrian uses the Notification Function quite regularly ever since. Outlook 2007 is waiting much more patiently than Adrian himself. It does not happen that Adrian is like a cat on a hot tin roof during a nice dinner. The important news find him, not the other way round!. Today, Adrian Wallisser has his important E-Mails forwarded as text message. Today Adrian safes money by sending SMS via ASPSMS.COM. Do it as Adrian Walliser does: use the advantages of Microsoft Mobile Service in combination with ASPSMS.COM! Wir übersetzen Ihre Geschäftsberichte, Verträge, Handbücher, Webseiten, Newsletter, Pressemitteilungen oder was sonst noch als Dokument anfällt, bei 10% Nachlass für Neukunden.